I’m writing this on my third hour sitting in a cafe on my second coffee, first cake and fourth glass of water. The autumn sun is warm on my back. I can hear the quiet toll of bells in the distance. And every now and then a well dressed waiter silently moves past, making my eye naturally move to the tray of cakes he balances without effort. Not being one to keep quiet about something good, I felt compelled to try and explain why I am now all about Vienna. Could you be more Austrian? For quality of life, Vienna is literally number one in the world and has been for the past seven years. Our walking tour guide explained that it’s down to the unique chilled lifestyle that the city does so well. An ex-banker, our guide explained that his work day began with breakfast, then another breakfast, then lunch- all being the norm. He believed that the water that they drink, which has a thirty year trip through the Alps, was an important part of the superior wellbeing of Vienna. He also proudly proclaimed that Vienna is the only place in the world where you can go to a coffee house, order a water and not be moved on (I didn’t test this out, the coffee is so good I couldn’t just stick to water!). The Volksgarten: The Peoples Garden. The city centre is a wonderers dream because Vienna loves walking. So much so that they have had a huge movement over the past few years to encourage more people to walk, resulting in pedestrian zones, logical traffic control and places that are so pretty, you find yourself walking by choice regardless of the weather. There are plenty of well kept public parks, dog parks and running paths. It’s clean. It’s tidy. It’s bloody beautiful. One thing I noticed in our trip is the distinct lack of heart rate increasing regular city-bustle. Sometimes, we’re not exactly ‘people people’. This can be a problem when we do the tourist thing. Tourists equal crowds; crowds can be beyond annoying when you’ve queued up for over an hour to see something ridiculously famous that doesn’t live up the the hype (Cough-Mona Lisa-Cough). Rejoice in Vienna; the anti-people persons dream. The clean, efficient U-Bahn never reached the dreaded Central Line levels of packed-ness and we often found ourselves walking down streets with nothing but the echoing of our own footsteps climbing the picturesque buildings around us. The only time we queued was when we visited the Schönbrunn Palace. But even while walking the picturesque gardens (Most of which you can see for free) you find yourself again in silence enjoying the moment. Maybe we got lucky, but when we saw The Kunsthistorisches Museum, it was quiet and peaceful perfect for learning, browsing and taking our time. If you’re looking for hustle, the Nauchermarkt was great for people watching and as we walked through it, it really felt like a place where good things happen. What those thing are, I’m not too sure. But I think we each got enough eye contact with some stunning Austrians where both of us could have scored that night- wink wink. After a conversation about the delightful lack of Euro-stags/hens of an evening, we did find the one place in Vienna where there were a few drunkies (albeit, all friendly, with none of them after a fight) at the Prater amusement park. Walking through it at night felt a bit like a zombie film waiting to happen. But my previous life as a film student had to pay homage to the beautiful ferris wheel famously shot in The Third Man. And yes, I did watch it prior to flying out. Vienna is famous for indulgence when it comes to cake and pastries. I liked that I could set my indulgent side off. How could I not with delicate apple strudel, famous Sachertorte and everything served with fresh cream that had been whipped (no sugary canned crap here, thanks). But then I didn’t need to search high and low for healthy eating. Like Berlin, the Viennese take vegetarian and vegan food seriously with a good collection of food outlets specifically catering for vegan or veggie food. I didn’t feel like I had to look for it, it just seemed to find me. Throughout our three night city break we’ve been brought back to the same question: why are we loving this so much? Was it the food? (I didn’t meet a meal I didn't like) The people? (Friendly, patient with my crap German), the sights? (Palaces, art, just a dash is history…) or the music (Think Mozart, Beethoven with a side of metal if you know where to look for it). Maybe it’s because in Vienna, you’re on your own time. It’s delightfully paradoxical, considering that you want to see all the museums, the palaces, the history and the food but you also want to sit in a cafe for three hours and watch the world go by. I want to do everything, but I want to do nothing. And by doing nothing, your experiencing true Vienna life. Back to the coffeehouse, and my next cup of coffee, my typical tourist concerns about not having time to do everything drifted away into the afternoon. 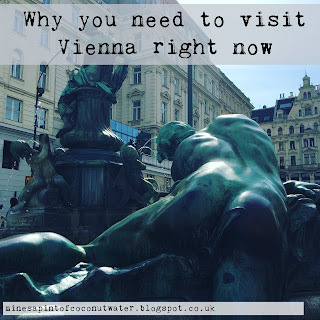 Instead I was filled with the quiet satisfaction that I was on Vienna time, and I would absolutely be returning in the future to explore more of what the city has to offer.